The company has innovative drug delivery technology: deep lung inhalation of solid microparticles. Company device inhaler Dreamboat delivers insulin formulation AFREZZA (insulin + pulmonary delivery excipient fumaryl diketopiperazine ) with ultra-rapid PK. MNKD PDUFA for AFREZZA is December 29th, 2010. Strongly recommended for investment in Q III 2010. Medium risk, high reward. In recent ALXA CRL FDA mentioned a concern about decreasing of FVE1 after Staccato using. It seems like that it can be real problem for AFREZZA too. The FEV1 is the volume exhaled during the first second of a forced expiratory maneuver started from the level of total lung capacity. FEV1 is by far the most frequently used index for assessing airway obstruction, bronchoconstriction or bronchodilatation; FEV1 expressed as a percentage of the VC is the standard index for assessing and quantifying airflow limitation. "During the parent trials, small, non-progressive differences in mean changes from baseline in forced expiratory volume in 1 second (FEV1) and carbon monoxide diffusing capacity (DLCO) were observed in the AFREZZA group. 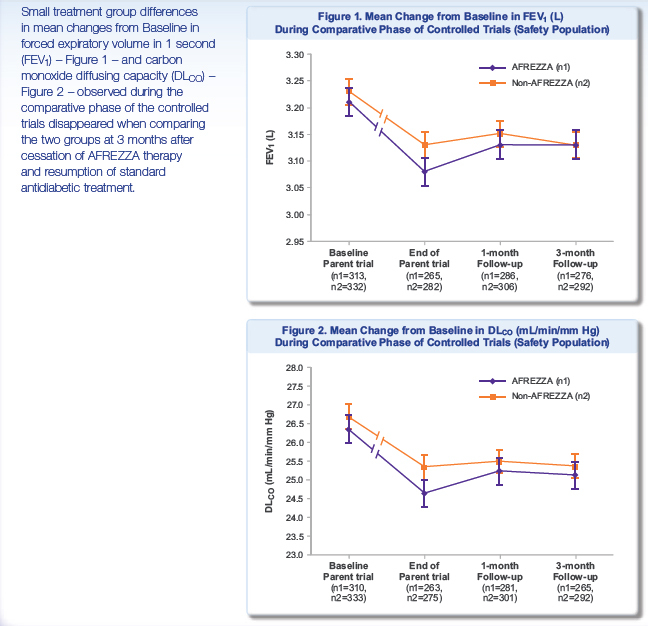 During the follow-up trial, these changes disappeared, regardless of the duration of exposure to AFREZZA, when the groups were compared three months after ending treatment with AFREZZA and resuming usual antidiabetic therapy (FEV1: -0.08 L in the ex-AFREZZA group, -0.11 L in the non-AFREZZA group [p=0.1388]; DLCO: -1.29 mL/min/mm Hg in the ex-AFREZZA group, -1.37 mL/min/mm Hg in the non-AFREZZA group [p=0.9360]). There was also no statistical difference in FEV1 between the treatment groups when examining subjects with Type 1 and Type 2 diabetes (p=0.6158 and p=0.1795, respectively)." "Results from the follow-up study suggest that the pattern and magnitude of changes in lung function associated with the use of AFREZZA in patients with Type 1 and Type 2 diabetes are not likely due to any structural alterations in the lungs and are not clinically meaningful." "changes in lung function ... are not likely due to any structural alterations"? FDA may ask MNKD: What if diabetes patients will use AFREZZA during many years? Even if AFREZZA approved FDA may ask about a label that asks for an initial FEV/(possibly PFT) test to get the baseline lung function data and a periodic test (once a year) to monitor the lung function. "BTW, can you do a follow up on MNKD? The market for diabetic is monstrous. The only problem I have with MNKD is their FEV1 issue but they have done multi-year study on this issue.....The PDUFA date is in Dec 29 but with BIOD expected to get CRL, MNKD is left with a unique position in a uniquely huge market potential." "You know I like MNKD science and know about their technology almost everything (I was working at drug delivery R&D during 4 years). So, MNKD has a perfect science basis. All trials reach all possible primary points. Honestly I was sure that lung safety profile of Dreamboat is also perfect. But recent ALXA CRL and last time MNKD PDUFA delay and almost 3 months FDA silence put some thought in my mind. It seems like FDA dislikes whole idea of deep lung drug delivery. May be it happened after Exubera lung cancer uncertainty. So now they will use any visible reason to postpone or reject these methods. Actually it was very strange coincident that both MNKD’s Dreamboat and ALXA’s Staccato devices induced FEV1 decreasing. Since I’m scientist this case put some idea into my mind. What the difference between these 2 devises and other inhalators? Both these new devises produce aerosol or in simple words dust. It doesn’t matter what kind of dust: insulin particles coated with carrier (MNKD) or vaporized excipient-free drugs (ALXA). But other inhalators called also nebulizers produce water mist from solution with soluble drugs. And as far as I know these nebulizers never decline FEV1 (or may be slightly). What about permanent lung dust exposure? Do it induce FEV1 decline? Unfortunately yes. I attached below 2 references and I have more. So, what the conclusions? Aerosol devices for deep lung inhalation (especially permanent) may induce decline in FEV1. It’s only my hypothesis, but FDA commissioners may also arrive to same idea. It will be complete crash for both companies. It doesn’t matter that MNKD trials showed that FEV1 recovered if patients stop using Dreamboat. FDA will ask them: what if after some long-term using these lung changes will become irreversible? What if this device after long time using will increase the risk of development of chronic obstructive lung disease (COPD) in patients? I agree with you that MNKD has a unique position in a uniquely huge market potential in diabetes. Dreamboat is really high-tech device that provided unique PK/PD drug absorption characteristics. But I think that the investment in MNKD is very high risk now. Reward could be also very high. I’m still thinking about it. May be I will do it but put under risk only 5 % (or less) of my assets. Again thanks for difficult questions. Any my subscribers welcome to ask me such questions any time and about any biotech company. It’s best payback for me. When I created this blog I wanted it to become interactive blog. Any idea and potential investment targets should be discussed. If you are disagree with my investment target just write me you concerns and we will discuss it. Hope my answer (and website) will help you to do right choice for investment in biotech. I’m sure that it’s very profitable area if you do it correctly. Good luck in biotech investments! Cotton dust exposure, across-shift drop in FEV1, and five-year change in lung function. Christiani DC, Ye TT, Wegman DH, Eisen EA, Dai HL, Lu PL. Department of Environmental Health (Occupational Health Program), Harvard School of Public Health, Boston, MA 02115. Relation between decline in FEV1 and exposure to dust and tobacco smoke in aluminium potroom workers. OBJECTIVES: To investigate the relation between pulmonary function and occupational exposure in aluminium pot operators. METHODS: 2795 observations were obtained in 630 workers over six years of follow up. An autoregressive method of analysis was used. RESULTS: After adjustment for FEV1 in the three previous years, the effect of smoking v no smoking on FEV1 was -43.1 ml, 95% confidence interval (95% CI) -72.3 to -13.9. Similarly, an increase in the exposure to particulates by 1 mg/m3 corresponded to a decrease in FEV1 of -11.9 ml, 95% CI -19.9 to -3.9. Age was a significant predictor of both FEV1 and FVC. CONCLUSION: Exposure to particulates in aluminium potrooms seems to increase the decline in FEV15 thereby increasing the risk of development of chronic obstructive lung disease in pot operators. ​​​​​It's visible that decline of FEV1 with AFREZZA is enough substantial and it need at least 3 months for recovery after stop using this device. May be it's really possibly that the regular and long-term using of Dreamboat (and Staccato) will emulate the chronic deep lung dust exposure. It is known from numerous published medicine papers that chronic dust exposure leads to FEV1 decline and "thereby increasing the risk of development of chronic obstructive lung disease (COPD)." You can read it here and here. Interesting but it seems like it doesn't matter what kind of dust were lungs exposed. The main problem is chronic dust exposure. Again repeat here that all these comments about MNKD is only my hypothesis. It based on literature search and comparison of FEV1 decline effect of 2 different aerosol inhalators: Dreamboat and Staccato. However, based on this I have decided to avoid the investment in MNKD before PDUFA. I'm still skeptic about easy AFREZZA approval by FDA. I did a literature search for MNKD science publication about AFREZZA mechanisms and its interaction with lung and found some recent paper: "Technosphere ® Insulin:Defining the Role of Technosphere Particles at the Cellular Level"
This study was funded by MannKind Corporation. All authors are employed by MannKind Corporation. "Technosphere Insulin, FDKP, and the other components of TI powder are not penetration enhancers in Calu-3 cells. Technosphere Insulin does not disrupt the tight junctions between cells, permeabilize or damage the plasma membrane,or induce cellular toxicity. These findings, combined with observation that neither TI nor FDKP increase insulin Papp,support the hypothesis that FDKP plays a passive role at the site of insulin absorption and that its function in TI is to act as a particle substrate that delivers insulin to the deep lung, where natural mechanisms of absorption then occur." So, insulin is absorbed by natural mechanisms. Well, guys, may you need to repeat some physiology courses. Human lungs are not designed to absorb proteins and peptides. Even human gut digested proteins and absorbs only amino acids. Of course, some drugs (mostly anti asthmatic) are delivered by nebulizers but usually these molecules are much smaller than insulin. Technosphere particles are micron-size aerosol i.e. dust. Lungs don't like any dust and they used different mechanisms to eliminate it. Long-term exposure of human lungs to dust may cause serious disease. Of course, not lung cancer but chronic obstructive lung disease (COPD). Also, since insulin lung delivery is really "artificial" unnatural method it may induce immune system answer. For example Exubera showed dramatic increase in anti-insulin antibodies (30 fold increase). AFREZZA also induces anti-insulin antibodies much stronger than SC injections: Type 2: Afrezza showed 3 fold increase anti-insulin antibodies production, control arm 2 fold increase; Type 1: Afrezza 8-fold anti-insulin Ab vs 2-fold for SC insulin injection. Thus, long-term AFREZZA using can trigger immune system to produce significant amount of antibodies against insulin. If you have IgG and IgM antibodies against insulin, your body reacts as if the insulin is foreign. This may make insulin less effective, or not effective at all. The antibodies can also change the amount of time it takes insulin to work, putting you at risk for low blood sugar. This means that the insulin cannot move glucose from the bloodstream into the cells. As a result, increased levels of insulin are needed to have the same effect, which is called insulin resistance. If the test shows high levels of IgE antibody against insulin, your body has developed an allergic response to the medication. This could put you at risk for skin reactions, or more severe reactions. Other medications, such as antihistamines or low-dose injectable steroids, may help to lessen the reaction. If reactions have been severe, an in-hospital procedure called desensitization may be necessary. Two possible treatments for insulin antibodies exist in the United States. Steroids, such as prednisone, mitigate insulin resistance, possibly by suppressing the immune response. Additionally, lispro insulin is resistant to antibody binding, due to its altered shape These two treatments are useful during the period of insulin insensitivity. Reactivity to insulin can return suddenly, making the possibility of hypoglycemia a serious concern in these patients. FEV1 declines during AFREZZA using and nobody knows what will happens with human lungs after 5-6 years of every day several times exposure to micron-size insulin dust. FDA may ask about Phase IV trial (Post Marketing Surveillance Trial) for AFREZZA and this clinical trial might last several years. Harmful effects discovered by Phase IV trials may result in a drug being no longer sold, or restricted to certain uses. Very sad news for MNKD (and biotech) investors... Again stupid CRL "requesting that MannKind conduct two clinical trials with the next-generation inhaler (one in patients with type 1 diabetes and one in patients with type 2 diabetes), with at least one trial including a treatment group using the MedTone inhaler in order to obtain a head-to-head comparison of the data for the two devices. In the complete response letter, the FDA stated that after an adequate titration of study medication there should be at least twelve weeks of relatively stable insulin dosing at the end of the treatment period." Worst scenario for MNKD and MNKD investors (at least -50% pps drop). I think that the reason for CRL is simple: FDA doesn't like the inhaled insulin and just postpone final answer (rejection). Next time they will ask lung safety trial or something else. Any way MNKD is crashed and out of fast-acting insulin market. MNKD should apply for European or Japan approval. They like innovative technologies. May be China too. MNKD was crashed badly by FDA CRL. 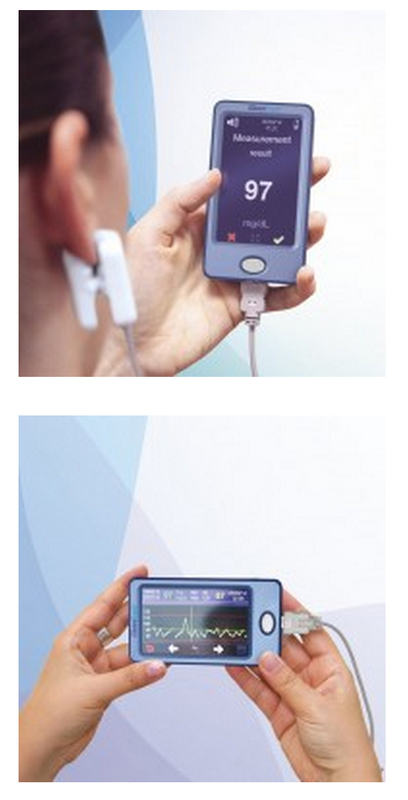 But CRL was not about lung safety concern, FDA just asked MNKD to compare old and new devices. CRL asking about the lung safety trial could be catastrophic for MNKD technology, but may be FDA doesn't see small and reversible FEV1 decreasing as a serious problem. 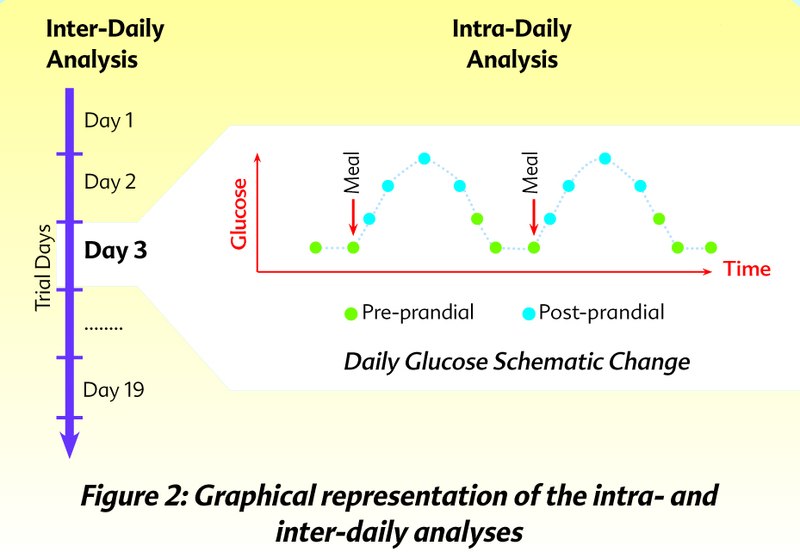 MNKD drug (fast postprandial insulin) is unmet medicine at diabetes area. I don't see any other alternatives to deliver insulin with Tmax 10-15 minutes and avoid long-term exposure of organs to high glucose level. BIOD "ultra-fast SC insulin" is nothing in comparison with MNKD inhaled insulin. But market reaction was very aggressive and unwise. Today pps is $3.50. Is it a good entry point? Buy cheaper, sell high... If MNKD pps is less $3.00 it will be very attractive buy for long-term (>1 year). Dreamboat is very effective device and will show same or even better results than old one. Disclosure: I don't have MNKD positions now. May open it at any time (at good entry pps). I have decided to open long-term MNKD position today or tomorrow. It seems like $3.50-3.60 was a real bottom price for this stock. MNKD needs to do additional clinical trials but what are these trials? Thus, it's just 1 year efficacy study. And the probability of trial success is close to 100%. MNKD will win this fight. Unfortunately after FDA delay CEO fired 40% of workforce. These people did good job and only stupid MNKD management was the reason for this delay. They did all clinical trials with old inhaler but they asked FDA to approve new version of inhaler. FDA is not so stupid to accept it. Sure that Gen2 inhaler is better but "never change horses in the middle of the stream". I'll buy MNKD at $2 or below (when market will be crashed by Iran bombing or any other "black swan event". Actually all small biotechs will be crashed. Spring time is a war time now (especially if it's arab spring). So, this May (05.12) or earler I will sell everything and will wait for a good entry pps for small biotechs. The "Revenge of the Fallen" is coming: MNKD is ready. I have a trigger to buy it at $2. Mann wants his $1B back and he will sell MNKD for $10-15 per share after FDA approval of "Dreamboat". And everybody wants to be in this dream boat at this time (me too). So, I'll buy 10k shares at $2 and wait for >500% gain in 2013. Mann is the man and he will never die as "fallen". 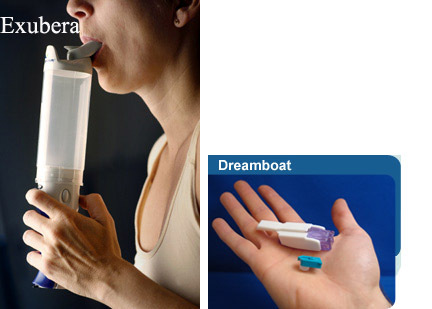 And "Dreamboat" is a 21 century device that will help to fight diabetes. So, MNKD is strong buy now. Why? The answer is simple: it's a win-win lottery ticket. The results of both clinical trials are already known: met all primary and secondary points. Because MNKD just repeats them with new device. So, this spring-summer MNKD will notify FDA that both trials are successful and file NDA for ultra-rapid postprandial insulin. Patients can use Dreamboat in front of people in restaurant and nobody even will notice it. estimated that the total direct and indirect expenditure for diabetes in the US alone in 2002 was $US132 billion (Hogan et al. associated with an increased risk of cardiovascular disease (Selvin et al. 2004). Is it not win-win lottery ticket? Any possibility to fail? Not even 1% because even old version of Dreamboat was superior to subcutaneous injection of super-fast injection insulin. How new generation device with more predictable and repeatable PK/PD results may fail in trial? ​​​​​​Disclosure: I have MNKD in portfolio (20k) and will double it in this month. P.S. FDA recently approved ALXA inhalation device (sublimated drug) that also had FEV1 problems. MAPP was acquired for almost $1B even before FDA approval of orally inhaled drug Levadex for the acute treatment of migraine in adults.Both drugs are delivered via inhalation i.e. it's lung delivery like MNKD AFFREZA. Main conclusion from these facts: FDA will not create obstacles for MNKD AFFREZA because of decreases in lung function because there is no such problem with AFFREZA using. I'm sure that in the future Dreamboat will be approved for children that have diabetes type I and type II. And one more thing: recruiting participants in new phase III trials took unusually long time (many investors were even angry with it). But it happened because this time MNKD management use a stratification strategy to search for eligible participants. It's more expensive and take more time but this approach allows the identifying the subset of the population most likely to respond to a novel therapy. Patient stratification involves the use of biomarkers to create subsets within a patient population that provide more detailed information about how the patient will respond to a given drug. Stratification can be a critical component to transforming a clinical trial from a negative or neutral outcome to one with a positive outcome. MNKD is in accumulation territory - funds want it for cheap. I hold both shares and 2014 Jan 3 calls for long. May be it's time to sell and go away? ​​​​​​Just look at time point around 24 weeks: HbA1c for TI is almost returning to level before treatment. Questions is simple here: will FDA approve Dreamboat if HbA1c decreasing will be much lower than for Insulin Aspart at week 24? Even if Dreamboat will show same efficacy as Technosphere? 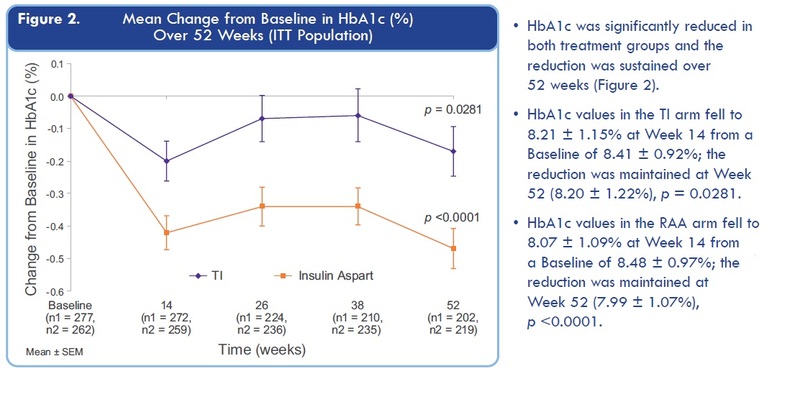 Last time TI induced HbA1c decrease at 26 weeks was just nothing in comparison with insulin injections (4 times less). So, simple conclusion: MNKD trial results might disappoint investors and FDA because 24 weeks HbA1c level retreat to starting level for lung delivered insulin. Was MNKD CEO blind when they plan new trial? May be they were hoping that Dreamboat is much stronger and HbA1c will go down? Disclosure: I still have MNKD shares and calls but will think about keep it or not through trial results release. If Dreamboat can't significantly change HbA1c for 24 weeks MNKD is doomed and stock will be crashed like CLSN stock i.e. to $1 range. MNKD future is still unclear. Will buy it near or below $5 for a long. It seems like that there is no a line of potential partners so Mann will borrow a money to go to market alone. He needs a lot so dilutions are imminent. I bought MNKD at $5 for a long. Several facts that pushed me to do it: Dreamboat in type II diabetes showed superior results in comparison with "fast" insulin injections. It is known that only in USA we have 28M patients with type II diabetes and they need a best treatment i.e. superior to current. Dreamboat will be welcome in Europe and Asia (China) - nobody like needles there too. FDA asked MNKD about these 2 comparative trials and now they got the results where all primary points met. If not - a giant scandal initiated by Mann and litigation against FDA that work against Americans. "Sell in may and go away" definitely is not for MNKD trading strategy - June and/or July should be hottest months for MNKD long and shorts. The only difference is that MNKD shorts will be roasted but longs will get "juicy roast beef" of big gain. My portfolio is 30% MNKD now so if MNKD jump to $10-12 the portfolio value will go over $1M (10X from 100K). Most likely Mann will sell the company for $10-12 immediately after FDA approval - he is very good entrepreneur and he sold all his company when they become valuable. 3 weeks before MNKD PDUFA: pps $10.35, short interest >68M (continue to increase) and all basher analysts predict MNKD crash via different scenarios like CRL (worst), no partnership and stock dilution after PDUFA generated pps spike (>$16) and etc. They still didn't use their favorite catch 22 - "PDUFA event is already priced in MNKD pps" so retail investors should sell MNKD right now. But look like that all their attempts are failed. Smart investors know these games and will never sell MNKD before such binary event. American Population with Diabetes Prevalence: In 2012, 29.1 million Americans, or 9.3% of the population, had diabetes. In 2010 the figures were 25.8 million and 8.3%. The prevalence rate for adults age 20 and older in 2012 was 12.3%, compared to 11.3% in 2010. The rate was 26.9% in 2010. The percentage is up slightly, from 35% in 2010 to 37% in 2012—and is now at 51% among those age 65 and older. Between 2009 and 2034, the number of people with diagnosed and undiagnosed diabetes will increase from 23.7 million to 44.1 million. The obesity distribution in the population without diabetes will remain stable over time with ∼65% of individuals of the population being overweight or obese. During the same period, annual diabetes-related spending is expected to increase from $113 billion to $336 billion (2007 dollars). For the Medicare-eligible population, the diabetes population is expected to rise from 8.2 million in 2009 to 14.6 million in 2034; associated spending is estimated to rise from $45 billion to $171 billion. The diabetes population and the related costs are expected to at least double in the next 25 years. Without significant changes in public or private strategies, this population and cost growth are expected to add a significant strain to an overburdened health care system. Conclusion#1: if FDA not approve new diabetes treatment this organization should be considered as "enemy of the state" one. Head of FDA should be "fired for reason" as stupid and possibly corrupted. About partnership: Mann promised it many times and each time FDA "cancelled" it by sending CRL. Now MNKD said that partnership is imminent and will be signed after 6-8 weeks after the drugs approval. Actually it's very strong statement. It means that partner(s) is just waiting for FDA approval documents and ready to start final negotiations (upfront, royalties and etc.). It usually takes a couple months. If MNKD management never get partner and just dilute stock during these 6-8 weeks Mann and his company will be sued by numerous investors for giant losses (especially who will buy MNKD at high after approval). Conclusion #2: Mann will have a partner or sell MNKD during 1.5-2 months after FDA approval. Or he will lose his face and reputation as "great entrepreneur". Not sure that he wants it at his age. Final conclusion: I have 80K shares of MNKD (bought at averaged pps $5.30) in my biotech portfolio (>40%) and will keep them through PDUFA and next couple months. I will not hedge my positions by selling 50% of MNKD stake before PDUFA but may be will do it after pps spike induced by huge short squeeze (at 68M short interest and 40% owned by Mann pps may jump to $20 or even higher). The U.S. Food and Drug Administration today approved Afrezza (insulin human) Inhalation Powder, a rapid-acting inhaled insulin to improve glycemic control in adults with diabetes mellitus. Afrezza is a rapid-acting inhaled insulin that is administered at the beginning of each meal, or within 20 minutes after starting a meal. An estimated 25.8 million (18.8 million diagnosed and 7.0 million undiagnosed) people in the United States or approximately 8.3 percent of the population–have diabetes. Over time, high blood sugar levels can increase the risk for serious complications, including heart disease, blindness and nerve and kidney damage. Afrezza is manufactured by MannKind Corporation, Danbury, Connecticut. Well, finally we got it. Actual notification happened at opened market without any trade halt. It was just crazy and so many MNKD investors lose MNKD shares because of stops and automatic trades generated by big pps drop. Shorts collected >30M shares below $10. But short interests is still high and may lead to massive short squeeze next week. Especially if Mann hit shorts with signed partnership. I'm going to sell 50% MNKD positions at spike and keep half for next binary event that was promised by Mann. Will use MNKD gain for investing in next binary event: EDAP AdCom July 30. Already collected 35k EDAP shares at averaged $3.60 and will add more (15-20k). The probability of positive AdCom vote >70% and EDAP pps should double after positive vote and FDA approval. MNKD ​pps is still dancing around $7.15 even after partnership with Sanofi and short interest grown to $77M. Many MNKD longs are very disappointed sold MNKD. Were they right? Nope. They did it because they were scared by bashers that lied that MNKD is "dead money" now and deal with Sanofi was very bad. Sales of MNKD AFREZZA will be lunched ​in Q1 2015 and most likely that millions diabetes patients in USA will want to try it. Also MNKD/Sanofi will file for approval in Europe, Israel, England and may be Japan, China. In Europe AFREZZA should be very popular especially if patients will monitor glucose with new GlucoTrack® model DF-F, which offers pain free monitoring of blood glucose levels. After short and simple calibration process, there are no test strips required, so there is no additional cost per measurement. ​​​​​​​​​​​​​GlucoTrack® model DF-F is a CE Mark approved truly NI device for self-monitoring of blood glucose SMBG at home. So diabetes patients will see in real time AFREZZA action. And they can compare injection meal insulin with AFREZZA and see how they fight with post-meal glucose spikes. This is a device for monitoring glucose levels which is worn on the wrist like a wrist watch. The device obtains automatic measurements of glucose concentrations non-invasively every 20 minutes for up to 12 hours at a time. Non-invasive means that the skin is not punctured to obtain a sample. Seeing is believing. Diabetes patients can monitor in real ​​​time AFREZZA action. And when they will see huge difference between AFREZZA and "fast-acting" injection insulins they will use AFREZZA for entire life. ​​A unique treatment that uses insulin in the form of a nasal spray shows promise for boosting memory in men and women with Alzheimer's disease, according to a study released in the Sept. 12 online edition of the Archives of Neurology. Both groups receiving insulin preserved their level of daily functioning, according to reports from their caregivers, while participants in the placebo group showed an overall decline in function. Few side effects occurred among those treated with the insulin spray, other than occasional light-headedness and dizziness or stuffy nose. Adults treated with 20 IU of the insulin nasal spray experienced improved memory and both doses of insulin protected general cognition and ability to function. No improvement was seen in those receiving the higher insulin dose. But the study lasted only four months. It is critical to note that if this treatment works in larger studies, it will not be available to patients for a few years, at least. Sanofi/MNKD also can design special 20 IU cartridge ​​and test it in small AD study. All MNKD longs and everybody who want to invest in MNKD should watch this video. ​​​​​​​​​Funds are controlling MNKD pps and designed "falling knife" chart for last 3 months. The goal is simple - all retail investors that have MNKD long should sell shares to funds and wait until MNKD will start moving up. The problem is that funds/institutions will accumulate all available MNKD float (i.e. > 50% of outstanding) and will not sell shares. Mann has 47% and also will not sale even one share. So MNKD pps can spike to $10-15 on good news and continue to $20. The price will be too high for small retail investors and funds will get all gain. 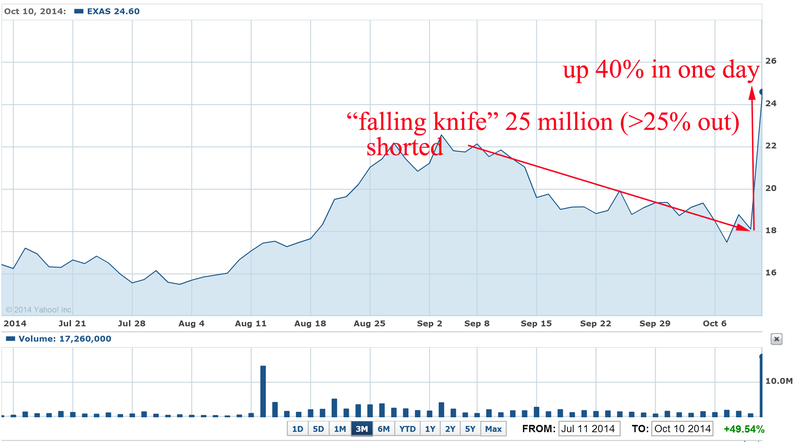 What were the news that burned short to ash and induce huge short squeeze? ​​ ​"Medicare officials are recommending a $502 reimbursement for Exact Sciences' (EXAS) Cologuard colon cancer screening test, according to a preliminary payment report issued Thursday night. If confirmed later this year, the $502 price for each Cologuard test is a big win for Exact Sciences because it means Medicare gave the company everything asked for during reimbursement negotiations. Exact Sciences' bulls on Wall Street were hoping for a Cologuard Medicare reimbursement in the range of $300-$500, while the bears believed Medicare would only recommend a price of $100 to $150 per test." Question: why shorts didn't covered EXAS at time? ​​Simple answer: funds that were shorting EXAS can't predict anything. They just sniff out stocks with 52 weeks high and short them. Question is why funds that are shorting MNKD are ​​not covering? 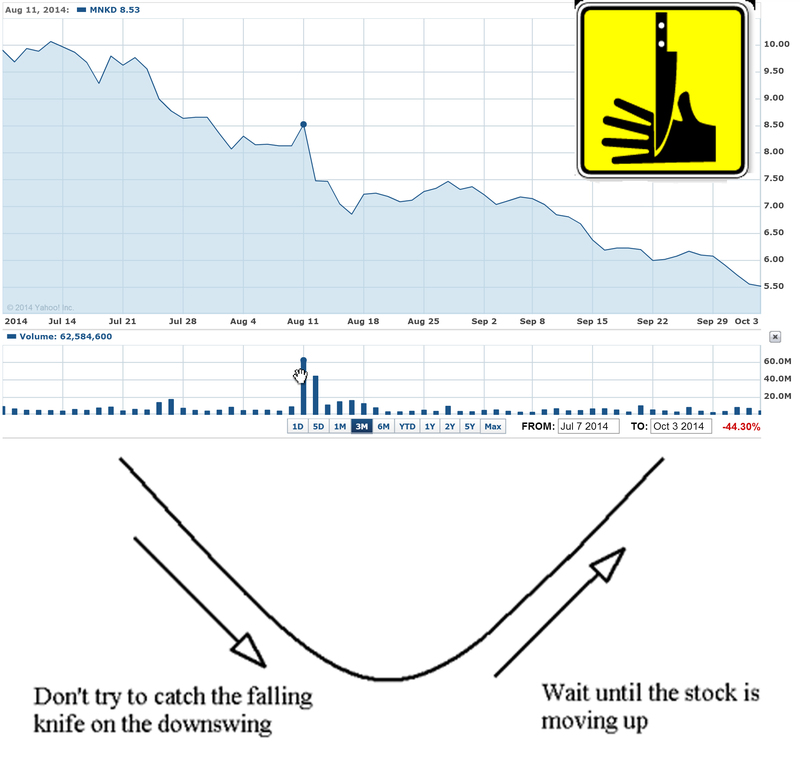 The simplest answer is: they are never covering shorted stock that continue to decline (in "falling knife" pattern). ​​​May be it's just trading machines are shorting MNKD because their algorithms are designed to sniff out such permanently declining stocks like MNKD. For them MNKD short positions are green now and they just wait for more gain. Why they are not afraid future MNKD catalyst event like EMA filing, November earning release where MNKD will say about >$200M cash on hands, update of AFREZZA manufacturing, start of Sanofi advertisement and etc. They just don't know about these events because they are not exist for them. Actavis PLC reached an agreement to acquire specialty pharmaceutical company Durata Therapeutics Inc. in a deal the companies valued at about $675 million, which is expected to strengthen Actavis’s business that focuses on infectious diseases. Durata shareholders would receive $23 a share in cash, a 66% premium to Durata’s Friday closing price, plus contingent value rights that would entitle them to additional payments of as much as $5 a share in milestone payments. Why shorts were continuing to increase DRTX short position just up to acquisition? It's crazy for biotech with approved FDA new and effective antibiotic. I bought DRTX ​​4/08/14 and said in 05/27/14 that DRTX is a buyout target now. It was so obviously that BP will buy DRTX. ​​So we have exactly the same situation with MNKD: shorts can't predict any catalyst events they are just blindly short stocks and don't cover them during pps decline. And sometimes this decline is actually induced by shorts. ​In case of MNKD shorts go in terrible trap when catalyst events will happen. It will be not easy to cover almost 80M shares: Mann has 47% or 180M and funds have >85M i.e. altogether >70% of outstanding. Everybody who bought shorted stocks ($5-8) will not sell them cheap. Conclusion: will buy more MNKD ​for long-term investment (1-2 years). ​​​Well, may be it's really good time to sell MNKD. Right now no one holder will complain against buyout price like $9-10. Mann is 90 years old now and he can't go to history without last victory. $10 buyout it's just $4B i.e. nothing for Big Pharma. They know that Afrezza is only the beginning of lung delivery inhalation approach for therapeutic proteins and peptides and for small molecules drugs that have low oral bioavailability and need fast PK/PD (migraine, high blood pressure etc). Even vitamin B12 can be mixed with diketopiperazine (DKP) and millions people that need to go to doctor's offices to get monthly intramuscular injection will just have 1 puff of "Bfrezza each month that will deliver B12 with 100% bioavailability. Migraine and anti-pain drugs will work extremely fast with Tmax = 5-10 minutes. Etc. ​​There is a recent example how Mann can easy increase MNKD pps 500%. Like in case of KBIO Mann group and major holders own >60% of MNKD outstanding. They can just said that they will no longer lend stock to shorts like CEO KBIO did recently. And now other shorts will scramble to cover their positions, leaving Shkreli and others who are long the stock with all the pricing power. "The situation is similar to the famous 2008 Volkswagen AG VOW, -1.36% short squeeze, when Porsche AG increased its stake in the car maker to 43% from 31% plus another 31% in options, giving it a 74% stake in the company. As the remaining 20% of the company was owned by the state of Lower Saxony, which was not willing to sell, short speculators were left with no ability to cover their positions. Volkswagen stock surged to more than 1,000 euros from about 200 euros in just a few days. Porsche wanted to take over Volkswagen, and not to speculate. But the massive short squeeze hurt hedge funds and investment banks who lost tens of billions of euros on their bets.